In this second "beta blog" I'll just mention a nice little feature: Search for Usages. 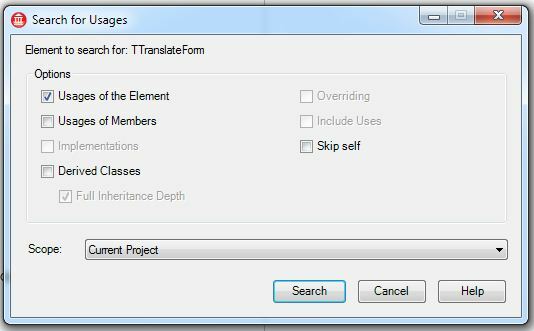 In this second "beta blog" I'll discuss a very simple and nice feature, only partially new to Delphi XE. That's all for now, might have more time in the coming days. This finally seems like a good improvement to the IDE. I hope they do not forget to assign a shortcut. Good! Searching is something one does a lot when coding. Yes, please consider adding search in comments. dropped it in VS 2010 entirely! not available in the context menu.